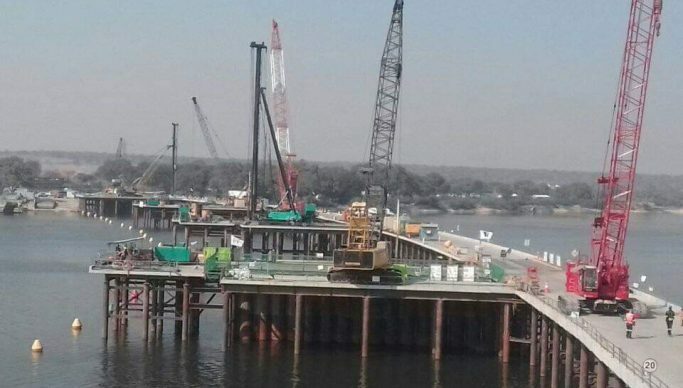 GOVERNMENT has announced the release of K20 million for the ongoing construction of the Kazungula Bridge. Daewoo Engineering and Construction company administration manager HongSeouk Park said on Monday this week the work would stall as the assured amount by the employer’s representatives to offset the overdue amount by the assured date had not been fulfilled. Park said the company was still experiencing financial constraints and would not be able continue with the project until the foregoing constraint was resolved. “In this regard, please be informed that the site will be closed from Monday the 18thmarch 2019 till further notice,” said Park. In a statement issued by Ministry of Housing and Infrastructure Development spokesperson Jeff Banda, Permanent Secretary Engineer Charles Mushota assured that the Ministry of Finance released the money on Friday, March 15, 2019. Mushota explained yesterday that the contractor working on the Kazungula bridge has not yet received the money due to technical difficulties in the money transfer. “The Ministry of Finance has assured me that they released the money on Friday last week. However, due to technicalities regarding government money transfer, the money has delayed in hitting the National Road Fund Agency (NFRA) account for onwards disbursement to the contractor.” Mushota said. “There is no need to panic as we are all determined to ensure that the contractor is paid and work continues. The Kazungula Bridge is a very important project government is undertaking and everyone is focused to ensure that there are no unnecessary delays in the construction process,” he said. The Korean multinational Daewoo Engineering and Construction which is constructing Kazungula Bridge yesterday closed down the site due to none payment of the obligation contribution by the Zambian government. But Mushota has assured the contractor and all the workers that they should resume work as government is seriously and competently addressing their concerns.